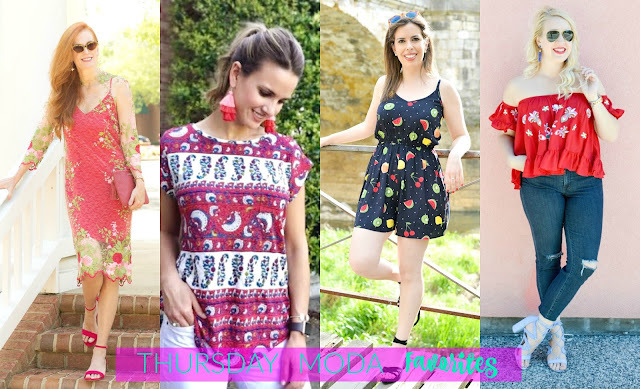 Cinco de Mayo Inspirations and Thursday Moda Favorites. This week's featured blogger is the always lovely and stylish AMY ANN of Straight A Style - the name of her blog suits her to a T. She linked up two lovely outfits last week, the first featuring the prettiest bow back gingham blouse and the second one featuring a bell-sleeve LWD embroidered with red flowers. Both outfits are styled to perfection. The first one is paired with such a chic light pink saddle bag and the second one looks perfect for Cinco de Mayo with grand statement earrings and feather laceup sandals - both in red. I myself am a huge fan of a little white dress in red embroidery paired with red accessories as I myself wore a similar look last week and blogged it here. Amy knows the importance of a pretty ruffle, statement bold earrings and a statement sleeve - all great trends for 2017. The best part is that Amy Ann is a brand new mamma and look how polished and posh she is. 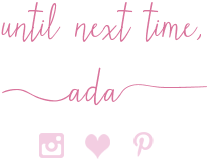 I just love her blog and style so much and this is the second time she is my Featured Blogger, too. Jess wears 'The Embroidery Trend' in such an elegant way. Her red lace floral print dress with sleeves is work of art and I love it with the red sandals. Jill shows her love for 'Tees+Tassels' and her red paisley print tee and ombre pink/red earrings paired together, would be perfect for today. Cristina's 'Fruity Romper' makes the perfect sweet Mexican Fiesta. If you check out her post, you will see she paired it with a bright red blazer. Emelia is ahead of the fashion game for the 'Cinco'. Her embroidered red off-shoulder blouse is beautiful and look more gorgeous tassel earrings. Are you doing any shopping this weekend?! What are you buying?! What are your Cinco de Mayo plans for this weekend?! 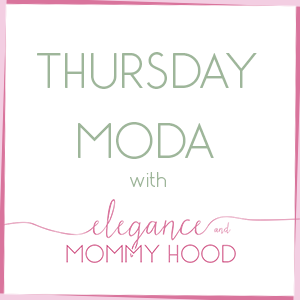 Before I leave for today, just a little reminder that you can still join my new Thursday Moda from this week.